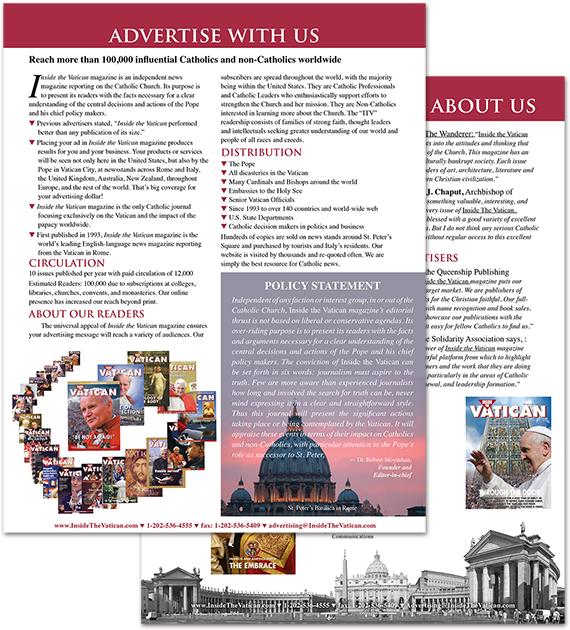 Why Advertise with Inside the Vatican news magazine? 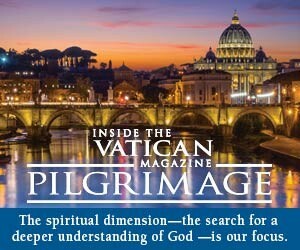 Inside the Vatican magazine is an independent news magazine reporting on the Catholic Church. Its purpose is to present its readers with the facts necessary for a clear understanding of the central decisions and actions of the Pope and his chief policy makers. Placing your ad in Inside the Vatican magazine produces results for you and your business. Your products or services will be seen not only here in the United States, but also by Pope Benedict XVI in Vatican City, at newsstands across Rome and Italy, the United Kingdom, Australia, New Zealand, throughout Europe, and the rest of the world. That’s big coverage for your advertising dollar! Inside the Vatican magazine is published by Urbi et Orbi Communications, a non-profit organization. Donations to either name are tax deductible in the United States. Inside the Vatican magazine is the only Catholic journal focusing exclusively on the Vatican and the impact of the papacy worldwide. Inside the Vatican magazine has become the world’s leading English-language news magazine reporting from the Vatican. Estimated Readers: 100,000 due to subscriptions at schools, colleges, libraries, churches, convents, monasteries. 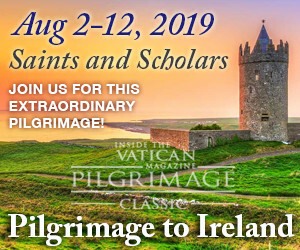 The universal appeal of Inside the Vatican magazine ensures your advertising message will reach a variety of audiences. Our subscribers are spread throughout the world, with the majority being within the United States. They are Catholic Professionals and Catholic Leaders who enthusiastically support efforts to strengthen the Church and her mission. They are Non-Catholics interested in learning more about the Church. The “ITV” readership consists of families of strong faith. Various State Departments around the world, including the U.S. Hundreds of copies are sold on news stands around St. Peter’s Square and purchased by tourists and Italy’s residents. Editors reserve the right to accept or reject any advertising. PAYMENT: The NET RATES for Advertising are the exact fees that are to be paid directly to Inside the Vatican. Agency Commission fees or other similar costs are not to be deducted from the Net Rates. First time advertisers are required to prepay the first ad. All payments are due by the last business day before the publication month, including contracts signed for more than one issue. Inserts Must ALWAYS be paid before each issue. OTHER subsequent page/partial page ads can be billed upon publication. To previous clients, billing invoices are NET TERMS 30 Days. Invoices not paid within 30 days will incur a 2% LATE FEE. International clients will be allowed 60 Day Terms. Payment MUST be made in US Dollars to the USA Office and made out to Inside the Vatican Magazine. One full copy of the publication will be shipped to each advertiser. CANCELLATIONS: An advertisement order canceled by the advertiser before the order is complete, will be billed at the higher rate deemed for actual quantity insertions plus 20% of the Net (1 time ad quantity). Should the cancellation occur within the same quantity range, there will be a CANCELLATION FEE of 40% of the Net ad cost. Cancellation or changes in orders may not be made by the advertiser or its agency after the copy closing date. Advertiser/client is responsible for all payments. Insertions for preferred positions and Covers cannot be canceled! CONDITIONS: Advertisers or representing agencies agree to indemnify and hold publisher harmless against any expense or loss by reason of claims arising out of publication or non-publication. Advertiser assumes all responsibility and liability for the content of their advertisement in all matters.